That’s a good idea. 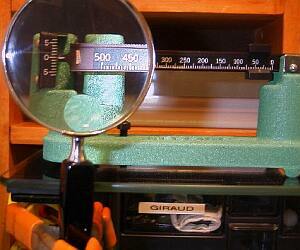 I had a hard time seeing my Redding beam scale too and thought about doing the magnifying glass thing. In the end I came up with a different and somewhat more complicated (not much really) solution that works even better I think. I placed a small (10″ I believe) TV set on my bench and hooked it to my video camera which is mounted on a tripod. I zoom the camera in on the scale which lets me view it on the TV screen in much greater detail than with the naked eye or even a magnifying glass. It’s so much easier to see this way that it probably speeds up my reloading by 25% or so.